This week we welcomed 13 members plus Spencer Denton, a colleague and guest of Lawrence. * Project Amigo Day of the Dead dinner is on October 27 th. Please spread the word to family, friends and colleagues, and plan to help fill a table. Diana provided the Rotary Moment. This year’s RI Presidential theme is “Be the Inspiration.” The word “inspiration” means to be “in spirit.” Membership in Rotary provides us with endless opportunities to be inspired, including: active participation in service projects (Matt and Ron helping with the Vancouver recycling, Sheila and Abigail in Project Amigo), serving on club or district committees (e.g. John and Abigail on the Peace Scholar committee with Gloria), doing club make-ups while travelling (thanks Frances for sharing your adventures), attending RLI training sessions and conferences, or less active participation such as e-club participation, e-learning, reading the Rotarian magazine or joining a virtual or local social network group that aligns with our hobbies. 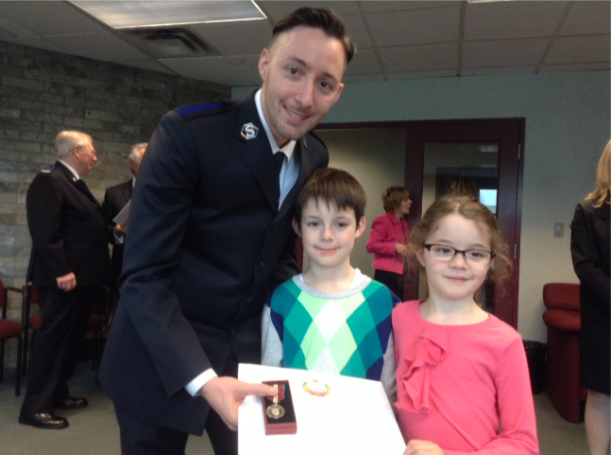 Today’s speaker was our newest member Jonathan Evans, pictured here with two of his three children Jedidiah and Jael receiving the Queen’s Diamond Jubilee Award for providing Social Services with the Salvation Army. Jonathan gave an inspiring Classification talk about his career helping others in Salvation Army missions across Canada and his work in Vancouver’s Downtown Eastside. Jonathan talked about establishing food programs, family programs, and harm reduction programs, with the emphasis on prevention by reaching out to and training young people. Johnathan’s site operates a Breakfast Program on Wednesdays where they hand out 300 bags of food to those in need in the local community. This summer, they also sent 100 children to camp and will be giving out 300 Back to School Backpacks. Johnathan also leads services in East Vancouver on Sundays and performs wedding and other officiant services. Next week’s speaker is Robert French former Vancouver Sunrise Rotarian, now crime novel author. Life’s most persistent and urgent question is “What are you doing for others?” Martin Luther King Jr.